Winter had taken hold. The temps were firmly entrenched in the single digits and I didn’t check the weather anymore; I just stopped on the bridge to watch the dark blue water sneaking past the ice, a fugitive from the floes. 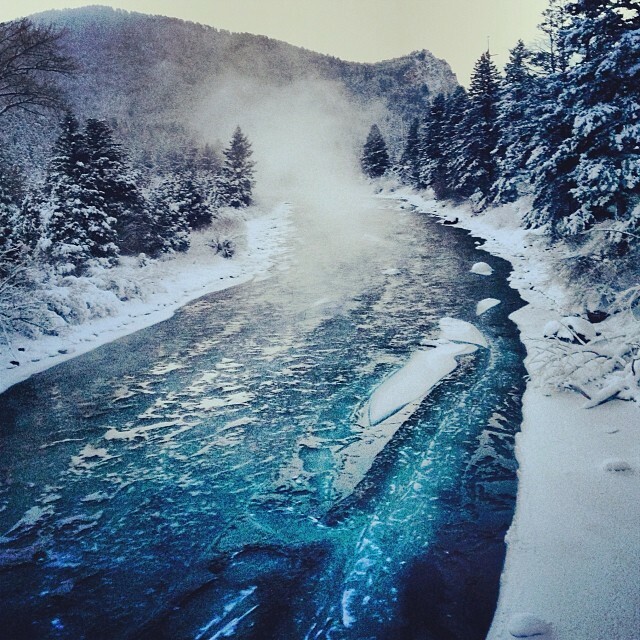 When the mercury bottomed out at -30, the river smoked its way up the valley like a prescribed burn. I ordered a case of rye whiskey from the liquor store in town and didn’t stop on the bridge again until March. When the ice began to melt, I watched. When the runoff came, I waited. When the water cleared, I went. This would be the season. I fished every day. I fucked up a lot, but rapidly learned to tie solid knots, figured out what bugs to use and developed a personal code of ethics on the river. I remember the first time I forgot to press a barb. I remember the first fish that went belly up. I remember every mistake I made and every so-called victory. But every day, I went. I learned. One night, curiosity led me to an access on my way home from work. I’d had a long day. I didn’t know the holes here. I caught a tree on every cast. But the river just went about it’s business. Efficient. Secretive. Selfish. Despite my efforts to work this stretch as I would the section that flows near my house, I caught nothing. Part of me wished I’d just gone home, that I hadn’t wasted my time where I didn’t know the water, but I kept at it - working the bottom of a hole below a large tree. Finally, a strike. I set the hook and that fish bent my rod end to end as it took off into the middle of the river. I struggled to stay with him, but lost my footing and the tension on my line. A flash of belly and he was gone. My white whale. I made a few dejected casts before moving upriver. I caught small fish here and there, but my heart wasn’t in it. The river would keep her secrets, I supposed. I decided to head out with time for one last try at the hole by the tree. I tentatively tossed my line into the gathering dusk. Even if I didn’t catch him, I knew he was in there and maybe that was enough. As the river pushed against my legs, my indicator dipped and I felt the tug. The set was instinctive. I stripped and my rod tip curved - we moved together this time. I kept tension downstream toward the shallows until I could grab the line. This part I knew. With one hand on the leader, I tucked my rod under my elbow and brought the fish to the surface. I removed the hook easily and kept my fingers light under his belly as he regained strength. To my surprise - and, by the look on his face, his as well - my white whale turned out to be a whitefish. But that was fine. He finned in my hand for a moment, translucent and nearly invisible in the water, then slowly swam back into the current. I made my way to the car, sat on the tailgate to break down my rod and fished a warm can of beer from my backpack. It was a nice change from whiskey.